The key to success on Amazon’s Marketplace is simple: you need to win the Buy Box. But there’s only space for one seller in the Buy Box. And that’s decided by a complex algorithm, running constantly behind the scenes. All the other sellers competing on that particular product are much less obvious to the buyer. There are many factors used in the Buy Box algorithm, but one is crucial: price. Not only does price have the strongest weighting, but it’s also the only Buy Box factor that sellers can change easily and immediately. So finding the right price to win the Buy Box, without going lower than necessary, is absolutely vital to a successful business. That’s where automated repricing software comes in. Repricers have been around for a while, but in the last few years the industry has exploded. There are now dozens of repricing tools and, for many of them, it’s hard to see how they’re different to the rest. But one that has always stood out to me, since their launch in 2011, is Feedvisor. This company has always gone against the grain. While other repricers tout the benefits of dozens of configuration options, Feedvisor boasts that it has none at all. Other repricers compete with low subscription fees, but with Feedvisor the fees start high and add on a percentage of sales. Yet Feedvisor is successful, growing 200% in just the last year. The company now has almost 1,000 customers, who sell a total of $1 billion of products through the Amazon marketplace. On their behalf, Feedvisor makes 75 million pricing decisions daily. And their reputation is outstanding, with a five-star average rating in the Web Retailer directory. I spoke to CEO and founder Victor Rosenman to find out more about this unusual company. We talked in-depth about his background, Feedvisor’s humble beginnings, and how his idea of “algorithmic repricing” came to fruition. Andy: Back in 2010, before you started Feedvisor, you worked as an ecommerce consultant. How did you get into that? Victor: It was quite a conscious choice for me. I came from the culture of the “start-ups” world, and I was looking for an area which would be the most interesting to start a business in. So I found ecommerce as an area first. And the interesting thing that I noticed about ecommerce was that there really is a lot of activity there. There were a lot of transactions, a lot of things changing hands and a lot of technology involved. But by reading around and speaking with people, I realised that there was a gap between the people that manage ecommerce businesses and the technology itself. I started to learn more about the industry, to see how I could help to bridge that gap. My background was from both the business side and the technology side, so I said, “Maybe I can help retailers manage this, to help them use technology to improve their business.” That’s how I started in consulting, and I spent about a year doing that. I built great relationships with people, visiting on-site, and learning their day-to-day activities. It was fascinating. I have good friends from that time, and I learned a lot about the challenges they’re dealing with. What kind of companies were they and what type of problems were you helping them with? Typically they were midmarket companies, making millions a year – maybe up to low hundreds of millions. One company was an offline business just moving online, but the majority were online businesses. They were dealing with a lot of different problems. Back then, at the beginning of 2010, the Amazon marketplace for general merchandise was a new thing. They didn’t always know how to sell on eBay either. They would have their own site and they would always know how to attract traffic. So they would come with a lot of the business acumen but wouldn’t really know how to use modern technologies to get it done. I worked with them to implement systems that streamlined orders for example, from any web store into their back end systems. I helped them connect to and list products in different marketplaces. Pricing came significantly later. Did your consulting work lead you into the technology behind pricing? Yes. A few companies that I worked with started looking into pricing, and two or three eventually became our customers. So yeah, that is how I learned about pricing. It’s not like 2010 was the Middle Ages, but five years in the technology business is a lot. Shopify were just at the beginning, and Magento was the “emerging standard”, but it was not yet purchased by eBay. So the world was really different from now. And the main problem for people was how to get their products listed. It’s not like 2010 was the Middle Ages, but five years in the technology business is a lot. They would look at Amazon and say, “How we can synchronise our own catalog, and our vendors’ catalogs, with Amazon’s? How can we get listed on eBay when there’s no catalog?” Once that was resolved, and orders were coming in, they’d want to figure out how to process them. So we would get the orders connected to their back end system. Then finally, with listing and orders running smoothly, they’d start thinking about price and optimization. By the end of 2010 I started to hear more and more about pricing. And as soon as they got on Amazon they’d say, “How we can manage pricing?” By about 2011 I realised it really was a problem. It was an emerging market, a lot of things were happening and no one knew how to deal with it. It was a classic situation for a start-up, with a big gap between need and the ability to satisfy it, so that is how Feedvisor was born. So did Feedvisor emerge gradually or did it become a major start-up straight away? Feedvisor emerged gradually over 2011. I did the research of what was there in the market. Now there are a lot of repricers, but at that time there were just two or three. So I looked at the solutions already out there, and I spoke with people who used them. At the beginning I didn’t think that I needed to start Feedvisor to handle pricing. I just said to them, “You can use program A or program B, so what’s the problem?” And they started to explain that it didn’t work. They were all rule-based solutions, so you had to program the logic yourself. How can they set the rules themselves, when they don’t know what the rules should be? If someone has faster shipping than you then you would add a discount, if you have a higher rating then you can ask for a higher price. You set the rules: add dollar, remove dollar, add percent, remove percent. People said to me, “Look, I really don’t know how to do this. How should I set the rules?” What they were saying made a lot of sense to me. How can they set the rules themselves, when they don’t know what the rules should be? Then I looked at how the repricing companies positioned themselves and they said, “One rule isn’t enough, so we have ten.” Then the next company would say, “Ten rules isn’t enough, let’s have twenty rules.” A war started and they started getting up towards sixty rules. But how can you set sixty different rules? They will interfere with one another – one would say, “Take it up”, and the other would say, “Take it down.” And then no one knows what the price would be. So I came to the conclusion that the right way for pricing software to work would be without these rules. If people don’t have enough information to set the rules, then it’s really unfair for technology to push the responsibility to the user. It’s basically saying, “Well, I’m selling you something, but it’s really up to you to make it work.” So that was one of the main insights for starting Feedvisor. I was still working as a consultant at the time, but I hired a programmer and together we started to build the foundations of what is Feedvisor today. The first version of the tool was very simplistic, and it didn’t have a lot of the user interface capabilities, but it solved the main issue of pricing. Eventually the better the buying experience is, the higher your price can be. So that’s all the very first versions of the software did: set the price without rules. It followed a very simple concept, and still follows that same concept, but it’s complex to implement. What’s the difference between different retailers? Why are their prices different? It’s because they provide a different experience to the buyer. You can ship faster or you can ship slower. You can accept returns or you may not accept returns. Your items may be in a better condition or in a worse condition. You may be more reliable, or less reliable. There are a lot of parameters that go into that buying experience. Eventually the better the buying experience is, the higher your price can be. So the price needs to exactly reflect that buying experience. If you are the retailer, you need to set the price that corresponds to the relative buying experience that you provide. If you want to increase your margin, work on the buying experience. Ship faster, and make everything smoother. There is great potential for retailers to grow and create a sustainable business. That is something we at Feedvisor wanted to solve. It was the core issue when we began and it’s still the core issue for us today. So did you always plan to start a new company, or did you expect to be a consultant in the long term? I would say that I started as an entrepreneur. I started with the goal to create a company. I went into consulting not because I wanted to become a consultant for life, but I because wanted to learn. I always knew I wanted to build a company. But I also knew that before you go and raise additional capital, you need to show that it works. So my first year was making sure that there was a solution that answers a real need. Once it works, and answers the real need, I can demonstrate easily the benefits we create for customers. Then it excites different people who can become your partners and investors. So I managed to prove that we had solved a real problem and we really generated value. And people stay with us, they don’t leave. That’s not because we do some tricks, but simply because they’re seeing value and building the foundation for their future growth. At that point I raised the seed capital and later on we raised additional funding. We have raised close to $10 million overall. I think we are the only really venture-backed repricing company. How did you get people to try your system? Were they surprised by the lack of configuration options? When I started the company I was thinking, “How can I get people to use it? How can I get people to trust us?” There were a few things I did. Number one, I didn’t ask people to put everything through our platform. I would just ask them to try a few products, see how it works, and then grow. That helped to build trust. We also created what we call a “partnership model”. Basically we were the first to charge a percentage of sales. Eventually we changed this model slightly, as you can see through our site, where we have a mix of percentage and a base fee, which better aligns to both the larger and the smaller sellers and their objectives. But when we started we had purely a percentage model. I would say it was quite controversial, but the idea was if we can make your life better then you would be more than happy to pay us. If we cannot make your life better then I don’t think we have a right to ask for payment. So you, the retailer, can decide which products you allocate to us. There was no base fee then, so you could engage with Feedvisor without any commitment, with nothing. You could say, “Okay, I’m putting in one product and I just want to see what happens. If it works well I will add more, and if it works really well I’ll put my entire account with Feedvisor.” That’s what really built trust. People tried it, and could see it working. The problem is everyone thinks alike. Everyone tries to be a little bit cheaper. Now, about configuration, the typical retailer managing repricing spends a huge amount of time simply managing rules – and there is one big issue with the rule system. It is more of a psychological issue than a technical one. We as people are all biased. One of the very core biases we have, is that we always prefer to reduce risk. So if you have the ability to make $100 or lose $100, we are always more motivated by the risk of losing $100 than the chance to make $100. People play the lottery because they can pay ten dollars and win a million. But if you said to them, “Pay $10 for a very high chance to get $20”, no one will do it. The small chance of losing is not outweighed by the amount they could win. Even with a huge chance of winning, people would not be interested. Now, what’s the problem? The problem is everyone thinks alike. Everyone tries to be a little bit cheaper. They create rules to be the same as the other guy, but a little bit less. And then at the end, when you combine all the rules, you have a phenomenon called the “race to the bottom”. The race to the bottom happens because everyone sets up their pricing on the same basis of always being on the safe side. It’s very funny, because by trying to be on the safe side, you end up doing the opposite eventually. From a practical point of view, how does a seller get Feedvisor to start repricing a product for them? The only thing you need to do in Feedvisor is to define your boundaries. You put in your cost structure so we can show you the gross margin, and what you really make. Then we help you to set the boundaries. Let’s say you want to sell a product for twenty to forty dollars, or pounds if it’s UK. The rest will be done by Feedvisor. You just sit and watch what happens. You will notice that eventually your profit margins go up, because now there is no bias. We calculate your relative performance and we set the price. We’re not trying to make you a little bit cheaper than the next guy – we’re actually trying to reflect your value. Eventually that becomes the strongest selling point that we have. We’re able to show people that by using machine-learning algorithms you eliminate the human bias. But you still have a lot of control. You define the boundaries, and you can see what’s going on. Later on we developed an additional system called Revenue Intelligence, which gives you a lot of transparency on what’s going on with repricing. You see which products are competitive, and which products are not competitive. We sometimes recommend that you change the boundaries to make the higher price higher, and the lower price lower, so we help you to manage those limits. But you solve two of the problems that you have been dealing with: you don’t need to think about all those rules, and your profits go up. That insight moment is when customers start to use Feedvisor intensively. How do you deal with sales velocity? If a retailer is willing to sell a product slowly, then they could probably set a higher price. Or if they want to sell it off quickly, they’ll accept a lower price and a lower profit. At the very beginning we didn’t have that functionality, but we added it over time and call it “Goal Driven”. So you set a goal, either sales or profit. Even if you want to go for sales we still optimise the profit, so if you want to sell three items a day, or thirty items a day, you will still sell at the maximum price point that allows you to do that. Pricing for profit is the very core of our philosophy. We don’t believe that we need to drive the market prices up. We just believe that we need to drive the market price to a point which completely reflects the performance of a given retailer. What was the next milestone for Feedvisor? Was it further innovations around repricing or different kinds of ecommerce tools? We never stop innovating about repricing. Our algorithm’s being revised I would say every month. The algorithms are continuously analysed and continuously revised, not drastically, but with small tweaks. As we learn the market we can usually analyse what we could have done better. Even if our customer sees good results, we still want to do better. At the same time we have a lot of transactions going through our systems. We use those transactions to learn and create better algorithms. But we’re also learning a lot of other things along the way. We’re learning market trends. We’re learning consumer behaviours. We’re learning competitive behaviours. We’re getting much closer to game theory in a sense, understanding how people play one against the other, and what really happens in the market. We’re learning market trends. We’re learning consumer behaviours. We’re learning competitive behaviours. With Revenue Intelligence, we basically use the same data that we already collect for repricing. But we use it to give you more insight into your operation, and especially into inventory decisions. If there are certain products you need to replenish, it shows you how many to order, according to your own goals. It can show whether you should replenish more, replenish less, liquidate some, buy new products, discount prices and so on. All these things have become the focus of our operation, together with repricing, and we are starting to see it as a single solution. We’re looking at the mid-market retailers and SMB retailers – they compete with the big guys. It’s tough for them because they don’t have all the scientists that the big guys employ in-house. We thought if we could help these retailers with the science – a kind of science-on-demand service – then they can inject it into their operation and achieve much better results. That has become more of our focus going forward – how we can help mid-market and SMB retailers to be more successful, without spending a huge amount of capital on employing very expensive data scientists. So are those the kind of people you employ at Feedvisor? Data scientists and economists? Yes, and I think that’s exactly what distinguishes Feedvisor from all the other companies out there today. And it’s what requires us to be a venture-backed company, because we’re very much data science and economics-oriented. The first data scientist we took on was the third employee of the company. He became our CTO – Chief Technology Officer. Before joining Feedvisor he was managing a research team at Verisign, where they worked on fraud detection algorithms. So he was an algorithmician and a data scientist. He was the first in technical research, working beside myself and a programmer who joined the team. Then we started to add a mix of people: back-end programmers on the one hand, and data scientists and analysts on the other hand. Today we have quite a few scientists and analysts in our team. The second thing we need to pay attention to is scale. At the start of this year, we managed over a billion dollars’ worth of GMV – Gross Merchandise Volume – through our system. Now we’re approaching almost two billion. It requires a huge amount of scale, because we’re running a machine that automates all the rules. We need to analyse every situation. We need to understand all the market dynamics. And we need to be able to take it to the scale where we manage millions of products, and we analyse each and every product and make sure that it’s all done correctly. Can you explain how algorithmic repricing works in layman’s terms – what happens inside the system when it’s making its decisions about price? As I mentioned before, we look at sellers’ performance characteristics. There are a lot of performance characteristics on Amazon, and we identified some when we published the Buy Box Bible. We quantify it all, and then use it to compare against other sellers competing on the same product. The algorithm does this analysis, and also understands how the Buy Box works. Our technology is capable of working with any ranking system, be it Google, eBay, Newegg or whatever. We haven’t launched support for those sites but at the core, the technology is very generic. So the algorithms look into all these parameters, and run machine learning by analysing a huge number of price changes, and seeing how different systems rank the sellers based on those parameters and actual sales. We continuously analyse all of this. We look at the parameters. We look at the behaviour of these systems. Then we feed it back into the algorithm. It’s not actually a single algorithm, it’s a large set of real learning algorithms that are trained through the data. Today we have so much data that our system can predict almost any situation that happens in the market. When we started we didn’t have enough data, so we had to focus the algorithm much more on experimenting. Today we have so much data that our system can learn and actually predict almost any situation that happens in the market. The system has created millions of patterns. As soon as it recognises that there are certain conditions that represent that pattern, then it knows what action to take. It could win simply by using the data. It makes a huge difference. If you say, “Well, Feedvisor uses an algorithm but this other company has an algorithm now”, even the same algorithm wouldn’t work as efficiently as it works for us today, because you need to do a lot of machine learning. The machine learning requires a lot of data that you need to crunch. So it becomes a chicken-and-egg problem: you cannot have a really, really good algorithm without having a lot of data to crunch. And you won’t get a lot of data to crunch without a good algorithm and a lot of time. To improve our performance, we’re measuring two things. We’re measuring our ability to price to maximize profit, and we’re measuring how fast we can get to that optimal price. The speed is just as important as getting to the optimal price. If I can bring you to that price in a few minutes versus a few hours, you can capture the opportunity as early as possible and increase profits. We’ve become successful and we’re getting more and more clients and business, simply because our algorithm outperforms everywhere. Even if a newcomer arrives with their own algorithm, it would require one to maybe three years to generate the data, assuming that the business increases exponentially. It’s as much about the data as it is about the algorithm. You have three standard price plans, with a lot of different features coming in at the different levels. What is Revenue Analytics which comes with the entry-level plan? The plans we have built are optimised for the needs of retailers with different sales volumes. We try to match our plans with the sales volume and sophistication of the retailers. So typically the very large sellers that sell in the tens of millions a year will be very sophisticated, and they’ll need a lot of data at their fingertips to make their decisions. On the other end of the scale there are people who are just starting out. They simply don’t need as much data, and they don’t need as many analyses. So Revenue Analytics is more of an aggregated analysis, and is perfectly sufficient for someone who is just starting their business. Someone who just wants to focus on repricing will be able to get the general sense of what’s going on. The more sophisticated the seller becomes, the more tools they require. Therefore each plan provides you with more and more tools, and it’s aligned with the needs of a different type of retailer. And the same with our pricing, it also aligns with the expectations of these retailers, of what they would pay for such a solution. You can’t expect a small seller to pay you $3,000 a month, and at the same time it would be silly for a very large retailer to pay only $100 a month for a solution that is managing millions. It’s not the cost of the tool, it’s the value it creates. So how does that differ from Revenue Intelligence, which comes with the higher plans? What might a retailer learn from that, and what they would be able to do because of it? You could be at very different stages of this product’s lifecycle in the market. When it’s just introduced you can buy more and, although the competition grows very fast, the demand still outpaces it. Eventually the competition outpaces demand, and this is the time when you want to liquidate. So Revenue Intelligence will help you to streamline your operation, by showing the sales velocity and your inventory needs. Another example is discounting. This is where you not only want to look into your past history, but you also want to predict what will happen in the future. A small business, or even million-dollar business, doesn’t need the predictive capabilities, because when you’re at the beginning of your growth all you need is to find the niches, invest there, get richer and repeat. Once your business gets bigger you need to be more sophisticated. You need to make profits, where before you might rather add a new product. You have a relationship with vendors, and want to develop product lines. This is where you need more and more sophisticated tools. What do you think is coming in the next two to three years in the wider world of ecommerce? I don’t know what’s really going to happen, but there are a few things that are already happening that we can try to extrapolate from. The first thing is the transparency of prices. In the past you would go to a store and see that some products were a dollar less, and you’d say, “It’s a good deal.” This rarely happens now. People really know about prices, they can easily compare, and they know that prices are way more transparent. As a result of that price transparency, prices will not stay static either offline or online – on Amazon or other channels. Yes, Amazon is leading the way because it’s a very crowded marketplace – it’s very dynamic. But if you have a site and you compete with someone like Amazon, or other sellers within Amazon, it’s a different story. How should you price your site? How should you price your offline store? How you should do it in various states or countries? All those things come to mind. And it’s not only online, it’s also offline. If you get to a store and the price there is ridiculous, you simply scan the product and buy it online. That’s why we believe that prices are going to be much more dynamic. You recently updated your brand and added the tagline “The Algo-Commerce Company”. Why did you choose that, and what does it mean for the future of Feedvisor? So it was a very natural evolution for us, because all the things we have been doing are algorithms, and we have created a scientific way to help retailers do better. 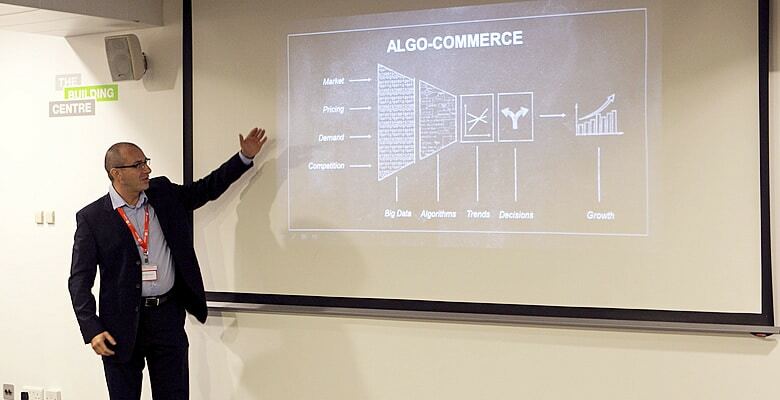 When we thought about how to describe what we are doing, the idea of “Algo-Commerce” said it exactly. It’s more like we’ve found ourselves rather than reinvented ourselves. We actually want to become the biggest company in the ecommerce performance space. In terms of the future, we see what we have as a very generic product. We have followed the needs of our customers, and we’re always in touch with them. We’re always trying to understand where they’re going. We see a growing number of businesses that use Amazon also using other channels, and creating private label products. We’re investing into research in those directions, because we really want to create the maximum value for our clients. So we’re going to invest beyond Amazon, but we’re not going to neglect Amazon. It’s a very important channel to a lot of our clients, and they’ve built their business in very close alignment with their Amazon sales. I believe as long as Amazon is going to play a central role in the ecommerce marketplace, it’s going to play a central role in Feedvisor. At the very same time we’re not going to be limited to Amazon. We’re definitely going to launch additional products that will cover new markets and new capabilities. We really believe that we’re building a big company. We actually want to become the biggest company in the ecommerce performance space. That’s where we’re focused and we want to build a good company, which creates value and brings positive results to both the retailers and the consumers. And I believe that is why we are successful. Thank you Victor. It was fascinating to hear more about Feedvisor’s history and your scientific approach to pricing. I hope your success continues.